Alessi Programma 8 Dinnerware: Circles Out, Squares In! Traditional circular plates? Not here! Alessi has shaken things up a bit. Now your dinner table will provide a delightful surprise for guests when they dine on square plates with a distinctly modern flair. Alessi is famous the world over for their contemporary twists on high-end tradition and we are very fond of their trend-setting designs. The Programma 8 dinnerware and serving platters are no exception. The Programma 8 dinnerware and serving collection was designed back in the 1970s by Franco Sargiani and Eija Helander. This was the era when modular design was becoming more mainstream, and they desired to use modular themes, applying them to kitchen and dishware. The white, porcelain pieces have clean lines and can be used for both everyday and formal place settings. Plates. 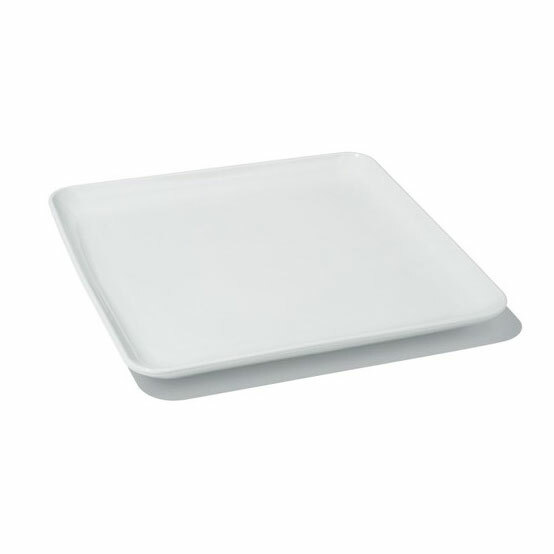 The plates come in both square and rectangular shapes of varied sizes. This gives the host the option of changing the plating to suit the menu. Bowls. We love these square bowls because they are so unique. They work for both soups and salads, and they're a wonderful twist on the mainstream round bowl we see everywhere we look. Accessories. Designers Sargiani and Helander thought of everything when they designed this complete line, including necessary accessories like trays, cutting boards, serving platters and sauce dishes. They even created a matching condiment set. The entire collection is 100% dishwasher-safe, making this modular dinnerware even more efficient. Contact Didriks if you would like the Programma 8 dinnerware collection for your modern kitchen.